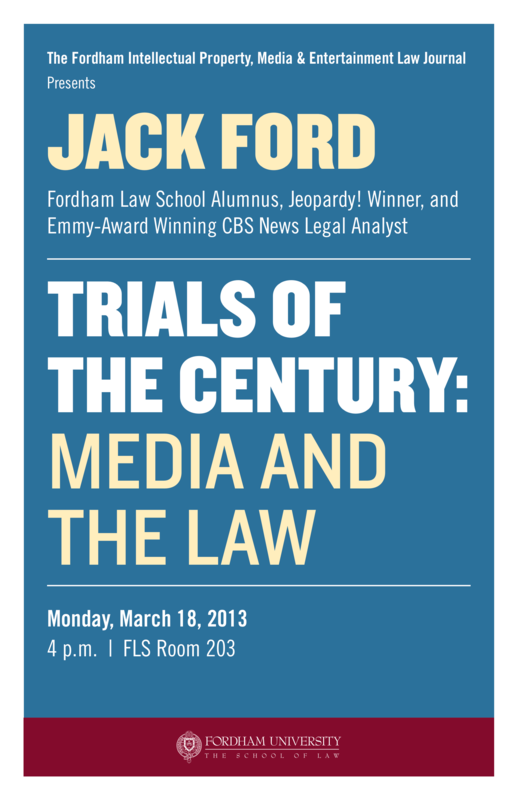 We here at IPLJ invite you to join us on March 18, 2013 at 4PM for “Trials of the Century: Media and the Law,” an exciting speaking event with Fordham Law School alumnus, Mr. Jack Ford. Following law school, Mr. Ford spent three years as a prosecutor in New Jersey before entering private practice. He became a prominent trial attorney, successfully handling such high profile cases as the Northeast’s first death penalty trial, one of the nation’s first corporate homicide cases, and the Wall Street insider trading scandal of the late 1980’s. In 1994, Mr. Ford joined NBC News as Chief Legal Correspondent, reporting on major legal stories for NBC Nightly News, The Today Show, and Dateline. In addition, he was the co-anchor for The Today Show: Weekend Edition and substitute anchor for Nightly News and Meet the Press. Mr. Ford joined ABC News in 1999 as an Anchor/Correspondent for Good Morning America, 20/20, and World News Tonight. Mr. Ford’s broadcast journalism work has been recognized with a number of honors, including two Emmy Awards, a George Foster Peabody Award, two National Cable Television Awards, a National Headliner Award, and the March of Dimes FDR Award. Currently he is the Co-founder, Chief Editor and Anchor of the American Education Television Networks, while also a CBS News Legal Analyst and a Visiting Lecturer at Yale University, New York University, and the University of Virginia.